Railpictures.ca - James Knott Photo: We’d chased an X597 north from Garnet to Brantford already this day (seen here) and were on our way to Paris to meet up with it there when we picked up 2111 on the scanner. Figuring out pretty quickly what that meant, we turned around and went back to Brantford. We were coming down Colborne heading for Clarence when we saw hoppers shoving through the intersection. With no time to spare, this one is actually shot out of the passenger window of my friend’s pickup truck. | Railpictures.ca – Canadian Railway Photography – photographie ferroviaire Canadienne. Caption: We'd chased an X597 north from Garnet to Brantford already this day (seen here) and were on our way to Paris to meet up with it there when we picked up 2111 on the scanner. Figuring out pretty quickly what that meant, we turned around and went back to Brantford. 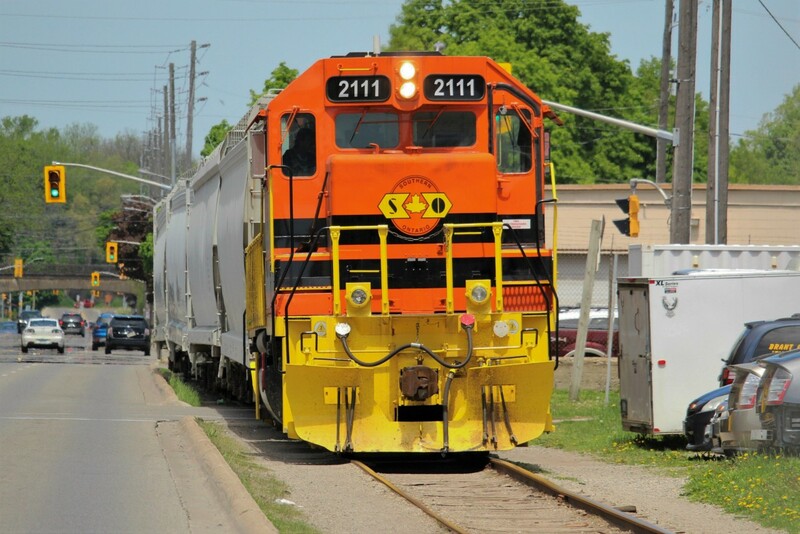 We were coming down Colborne heading for Clarence when we saw hoppers shoving through the intersection. With no time to spare, this one is actually shot out of the passenger window of my friend's pickup truck. Beautiful shot James!!! Sadly I wasn’t able to make it up to the Burford before SOR finished but glad others caught the action before it was finished. It’ll be interesting to see what becomes of the Burford in the next few years.